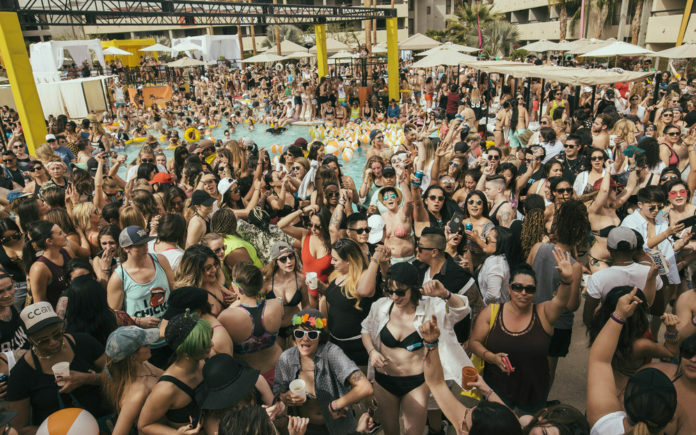 Entering its 29th year as the largest girl party music festival in the world, The Dinah is back in 2019 with the five-day event taking place in Palm Springs, California on April 3-7. The event will include massive pool parties with world famous DJs and go-go dancers, red carpet events with nationally renowned musical performances, meet and greets with your favorite celesbians, and so much more. Mariah Hanson founded world famous Club Skirts Dinah Shore Weekend in 1991 with the intention of creating a safe space for women and women-identified individuals to celebrate, unite, and empower each other. Since then, the event has grown to be considered the largest lesbian event in the world. Hanson has not only carried on her mission with an event once a year, but has used the Dinah to spread this message all year long through her important work with organizations such as The HRC, National Center for Lesbian Rights, and GLAAD. Giving back to the community is at the core of The Dinah. Hanson also has a keen ear for the best musical acts that appeal to the female listener. From 2018 headliner Jessie Reyez, whose short film The Gatekeeper, and song of the same title are considered precursors to the #metoo movement and Madame Gandhi’s “Future is Female” to past acts such as Lady Gaga, Kesha, and Katy Perry, festival-goers know they’re always in for a great show! There’s a great lineup in store for 2019. The Dinah is pleased to welcome Grammy Award winning artist Daya as a headlining performer for the 2019 event! After making her debut with 2016’s double-platinum single “Hide Away,” 20-year-old singer/songwriter Daya wasted no time in skyrocketing her career. Soon after, she won her first ever Grammy Award for the smash collaboration with The Chainsmokers “Don’t Let Me Down” (6x platinum), released a gold-certified album, and headlined a national tour. Just months after debuting at #5 on Billboard’s 21 Under 21 list in 2016, the Pittsburgh-born independent artist emerged as the youngest honoree on Forbes’ 30 Under 30 music list in 2017. Currently finishing up her sophomore album, which will showcase the full depth of her talent and artistry, Daya hopes to continue the conversation on love, life, and the current state of our world with her fans, and looks forward to releasing new music in early 2019. With so many amazing musical performances already on the books for The Dinah 2019, they’re also excited about their hilarious comedy talent: Fortune Feimster and Chaunte Wayans! Both of these amazing women are making huge waves in the comedy world, appearing in feature films and on hit TV shows across major networks, collaborating with the likes of Chelsea Handler and Katt Williams, and releasing stand up specials on Comedy Central and Netflix. Both women are wonderful examples of never holding back your talents and powering through to find massive success in a traditionally male-dominated industry. They can’t wait for them to put stitches in your side at The Dinah’s Comedy Show.